We’ve already gathered Magento 2 product parts finder extensions in a corresponding article, but now it is time to compare our two favorite modules: Products Parts Finder by Amasty and Product Parts Finder by Magedelight. Let’s see how different they are. Below, you can see the core opportunities both extensions offer. Multiple drop-down filters on a single page. Now, when you know core features of both Magento 2 product parts finder extensions, we can proceed to their backend implementation. 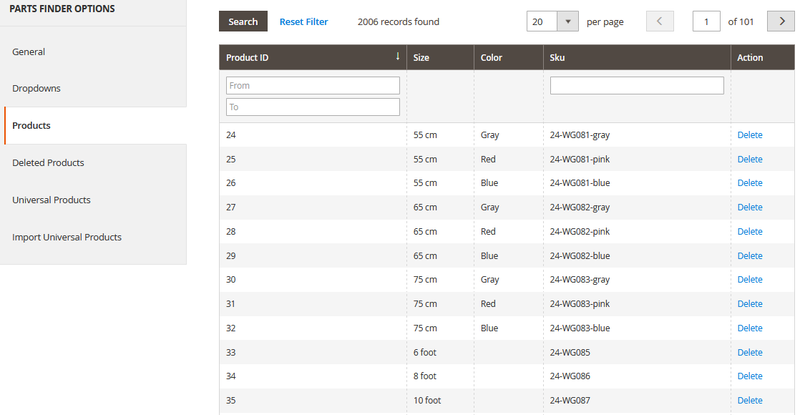 You can create an unlimited number of product parts finders in the admin, which are stored in a grid. The grid illustrates such parameters as a finder ID, name, and a number of drop-downs. Now, let’s see how to create or edit a finder. 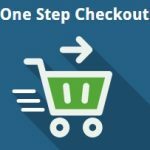 All configuration options are available in seven tabs: General, Drop-downs, Products, Import, Import History, Universal Products, and Universal Products Import. The first one allows you to specify or edit a finder’s name, choose a template, enter a custom destination URL, and copy the code for inserting. 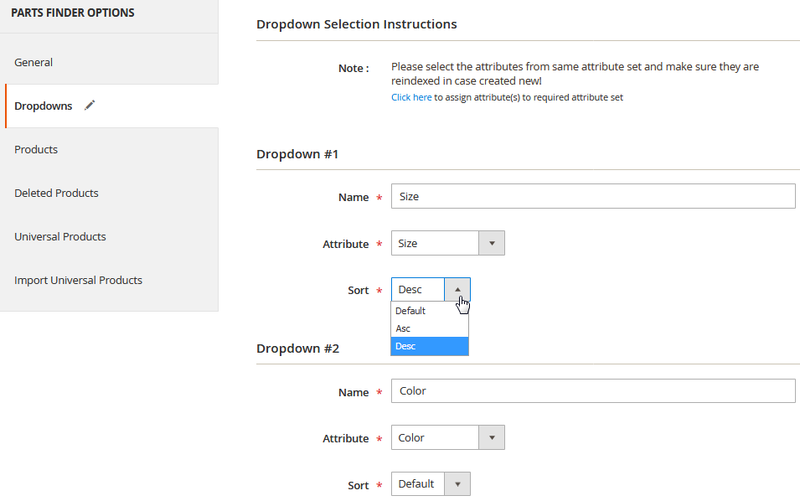 In Drop-down, the Magento 2 Product Parts Finder by Amasty allows specifying such parameters as Name, Sort, and Range for each drop-down. Next, there is the Product tab that contains products associated with the finder. You can view Manufacturer, Material, Color, and SKU for each item. And it is possible to add/delete products here. 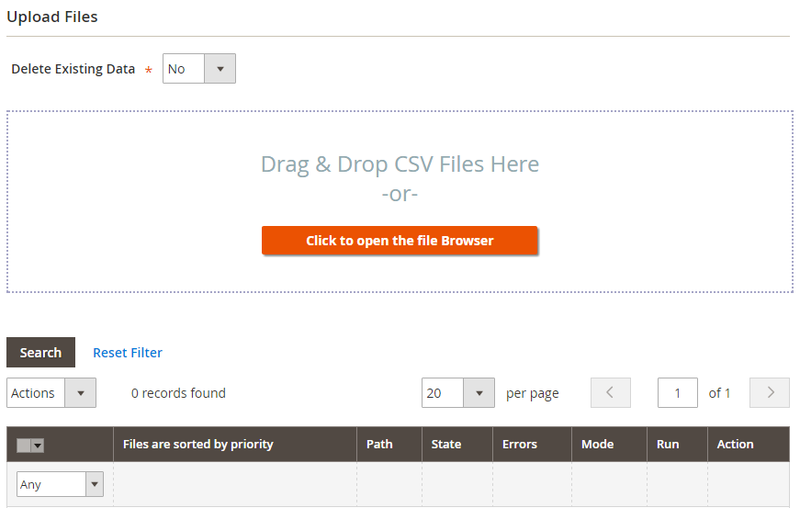 As for uploading a new CSV with product data, the Magento 2 product parts finder extension by Amasty enables you to drag and drop the necessary file. 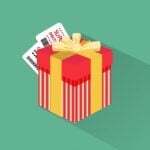 Existing data can be erased after a new CSV is uploaded. 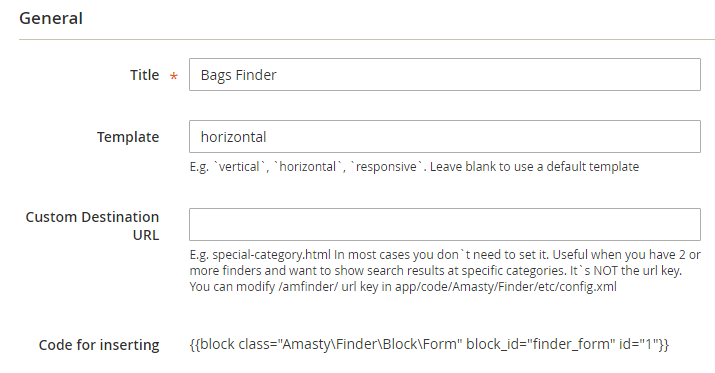 All settings of the Magento 2 product parts finder extension by Amasty are available in two sections: General and Import. In Import settings, you can specify an import history lifetime and a maximum number of rows per import. 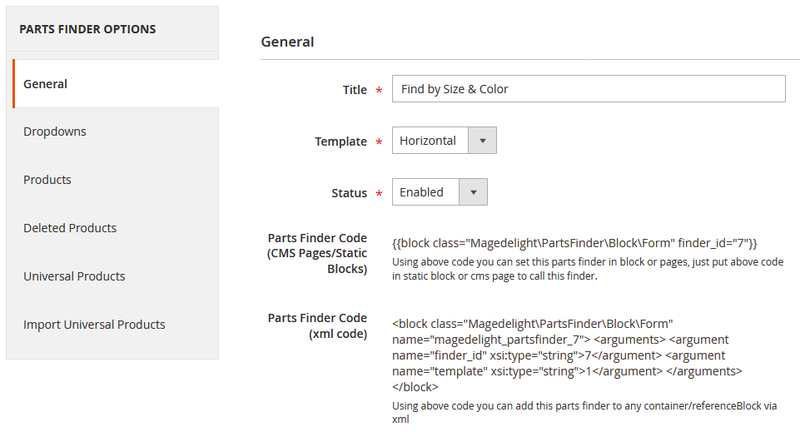 Now, we can explore the corresponding sections of the Magento 2 Product Parts Finder extension by Magedelight. The corresponding grid includes records of all available product parts finders and shows their ID, name, number of drop-downs, template, status, and dates of creation/update. While editing an existing parts finder, you have to deal with six tabs: General, Drop-downs, Products, Deleted Products, Universal Products, and Import Universal Products. The first one provides the ability to create any name for your parts finder, set the number of drop-downs, choose a display type (vertical or horizontal), and enable the parts finder on the frontend. Besides, you can copy a code necessary to place a parts finder filter on any CMS or category page of your website. 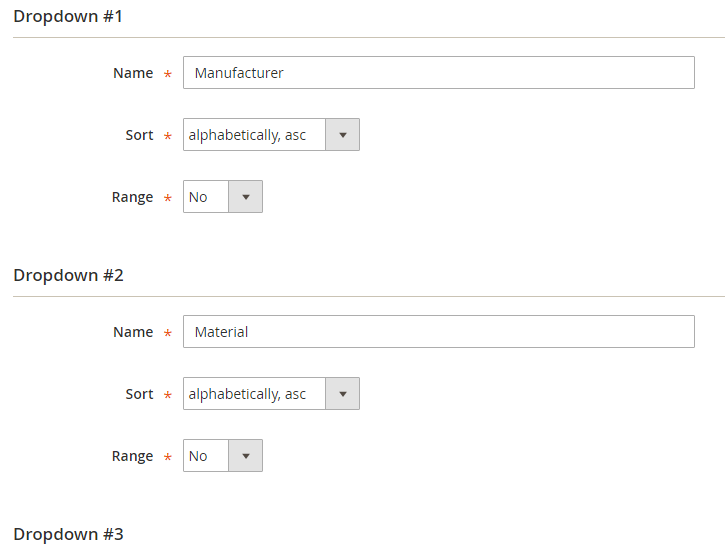 Next, set product attributes of your parts finder for each drop-down individually. Specify a name that will be used as a drop-down caption, choose a search attribute, and set a sort order. 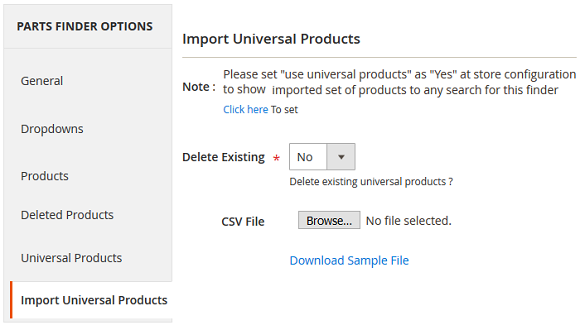 Since the Magento 2 product parts finder extension loads products dynamically from the products catalogue for the selected attributes, there is a corresponding grid where you can edit or delete any product. In the Deleted Products tab, you restore deleted products moving them back to the previous grid. The Configuration section of the extension is divided into two parts: License Configuration and General Settings. The first one allows you to paste a serial key and an activation key. Next, specify websites to display finders on and enable the module. Enable parts finder on the homepage of your store and select which finders you’d like to display there. It is also possible to enable/disable universal product for the corresponding page. Below, you can see how both vendors represent their product parts finders to Magento 2 on the frontend. 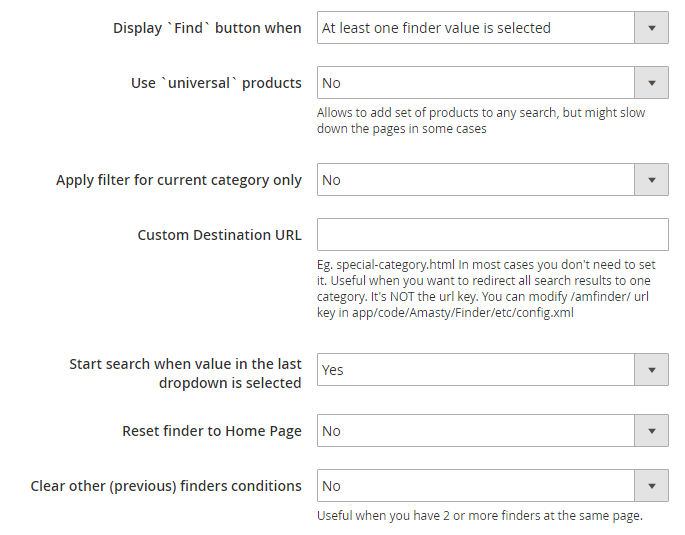 Amasty allows you to select all filter parameters, reset filters, or start a search for a single parameter. The price of both Magento 2 Product Parts Finder extensions is the same – $199.